I have been 100% self-employed and living the CEO of Me® life for a long time now. I have a lot of people tell me they don’t know how I do it or that they don’t think they could do it. I also have a lot of people ask me to share my secrets to success. That was part of the inspiration for starting this blog over a year ago. I am excited to finally be starting on a series of articles all about how to be a successful CEO of Me®. 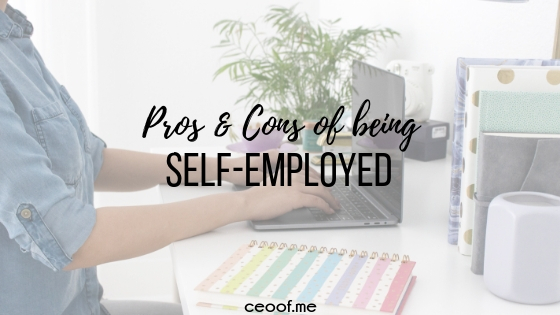 While being self-employed is very rewarding, there are a lot of things you need to consider before starting your own business. Being self-employed is not for everyone. Below are a few pros and cons you need to consider before beginning your journey to be a CEO of Me®. Must be disciplined enough to actually work your business and put in all the hours necessary to run a business as it may take more than 40 hours a week when you are starting out. Having to play all roles of a business – CEO, secretary, accountant, customer service, shipping department, conflict management and maybe even the janitor too. If your business includes making a craft, handmade item or selling a product, you may need to purchase inventory or supplies. You may need to purchase a business license in your town or county, may need to consider filing for an LLC or trademark. I hope the cons don’t scare you away. The rewards you will gain from being self-employed are worth so much more than any of the negatives. The bottom line is that if you are willing to sacrifice a little time, energy, sweat & money, you can get back a huge reward, financially, emotionally and mentally in the long run! What about you, are you or have you ever been self-employed? Are there any other pros or cons you have experienced? Feel free to comment below and share your thoughts and experiences! PS. Be sure to check out my Best Life & Business Planning Course before you go! It includes training and worksheets that cover mindset, confidence, goal setting, money management, marketing, content planning and creating a vision and plan for your best life & business! You can get access to the first video & workbook section on Mindset, Confidence, Overcoming Fear & Creating your Vision for FREE! Thanks for the pros and cons. It takes a lot of work to be self-employed, I definitely need to work harder at my organization and motivation. Thank you! This is so helpful! So much stuff to consider. Nice list! I’ll be taking this leap soon and it was nice to read this for encouragement! thanks Katherine! Good luck on your journey! Be sure to check back for future posts in this series. There are a lot of sacrifices/cons but the rewards are always worth it! That’s a great list. I definitely see it in myself! It’s sooo good and sooo frustrating sometimes! People just don’t get how much work it takes. But it’s well worth it at the same time. I dream of being self employed someday. Thank you for covering the positive and negetives! Scheduling or working with kids around and the insurance are the two biggest issues for me. Great list of Pros though! Yes I still don’t have insurance so that’s been the biggest sacrifice for me… However there are decent insurance plans most people can get. Due to pre-existing conditions insurance for me is just too expensive right now… Once I am debt free I will be getting insurance though! This is a good list. Sometimes I’m amazed by the ppl that think self-employed people don’t have to work! I think they get the same bad wrap as Stay at home moms that ppl think sit around and watch tv all day…not running after kids is hard too. Love the series! I don’t have health insurance delivering so luckily? that won’t be a change here, if can ever get to where you are and be 100% self employed. Oh yea, if it meant lower rates I would be happy too, but think that only means while coverage can’t be denied they don’t have to make it an affordable rate. Know they have provision that if can’t afford insurance won’t be fined, but didn’t who decided that. For those of us that make decent $ but also have debt we will probably be forced to get it and in turn to stall or reverse the debt reduction process. Wonder what kind of provisions there will be for people that only have income that is from having their own business and that in turn can have variable income each month.